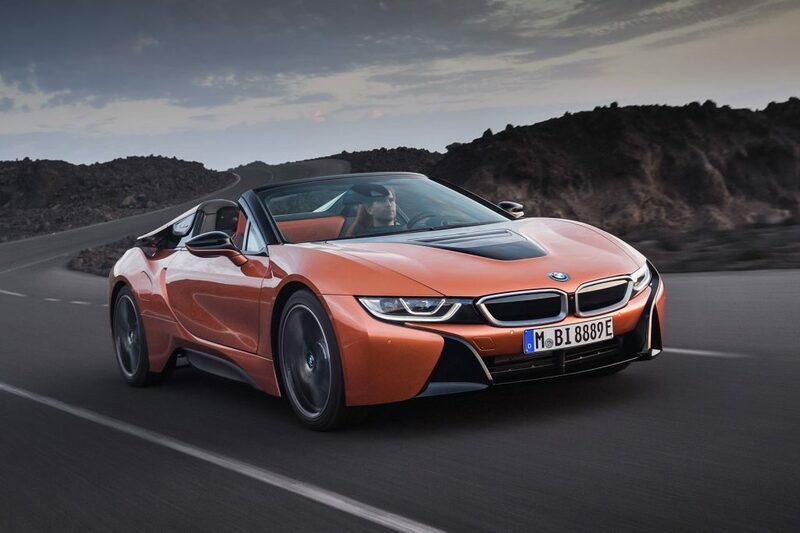 BMW have finally revealed an opened-top version of their hybrid supercar – the i8 Roadster, at the Los Angeles Motor Show. Almost everything is shared with both cars, the coupe and roadster – including the new updated design and of course the hybrid powertrain. The car gets a reworked windscreen that boasts of a stronger frame and quarter windows to help in the ease of stowing away the new folding roof that hides under a panel incorporated within two buttresses behind the cockpit. The soft roof that is made of a large fabric panel and header rails and opens in just 15 seconds at speeds not more than 50kph. It does away with rear side windows, and instead gets new black panels with aluminium trim, with ‘Roadster’ embossed on either sides. Also, there is no see-through ‘boot cover’; instead, it gets an openable tailgate. 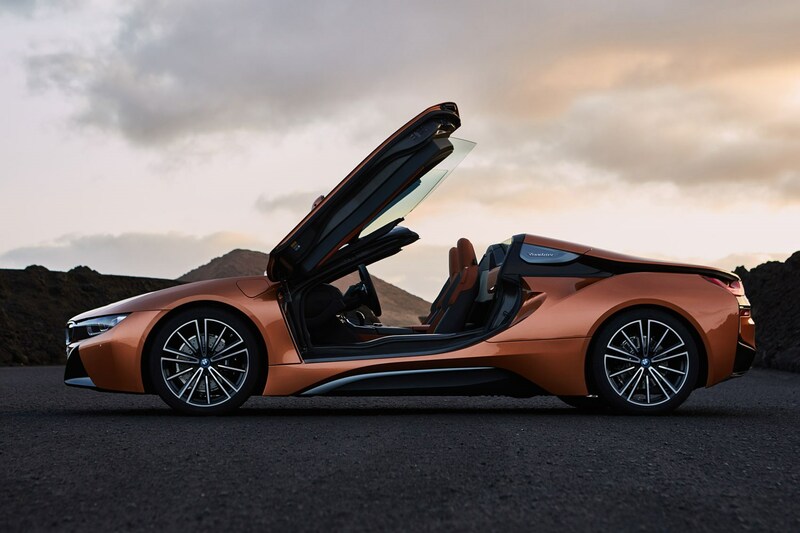 The i8’s carbon-fibre reinforced plastic and aluminium structure, which helps it weigh as little as 60kgs more than the coupe. The Roadster is a proper two-seater, so no room for peeps at the rear. 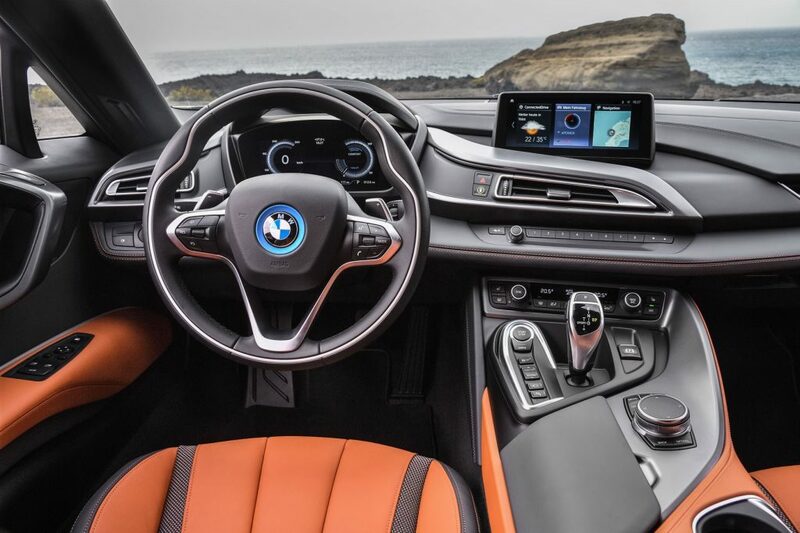 The dashboard design is shared between both, the coupe and roadster and sports the latest iDrive system that comes with touch-control on the 8.8-inch monitor. It also gets an optional heads-up display, newly designed seats, a range of new trim including ceramic controls within the centre console and carbon-fibre elements on the dashboard. A mid-mounted 1.5-litre, three-cylinder turbo petrol motor works in sync with a front-axle mounted electric motor. Power is sent all four wheels when both, petrol and electric motors are working, while power is sent solely to the front wheels on electric power alone. The petrol engine makes the same 231hp and 320Nm of torque, while the electric motor gets a bump-up to 12hp, make it a total output of 374hp. The 0-100kph sprint is dealt with in 4.6 seconds, while the updated coupe does it in 4.4 seconds. An electronically-limited top speed of 250kph has been claimed for both cars. Also, a new lithium-ion battery has an improved cell capacity of 34Ah and an energy capacity of 11.6kW. The battery range allows the car to travel up to 53-55kms. However, speed will not exceed 120kph on battery power alone. The new 360-degree electric charging system provides 7.2kWs of charging and 80% state of charge for both cars in less than three hours.